Seismic Skate Systems will be one of the lead sponsors for the 7th Annual Vernon Downhill IGSA North American Championships! 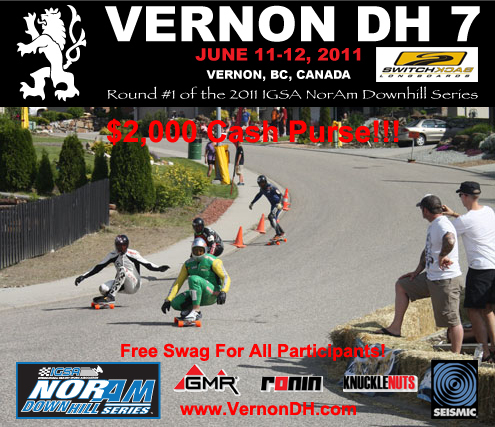 The 7th annual Vernon Downhill is also the IGSA North American Championships for the third consecutive year in 2011. Vernon, BC is the place to be June 11-12 to see the best downhill skateboarders in North America battling it out for the championship. Taking place in the residential neighborhood of Middleton Mountain in Vernon, BC, the race is unique by running through a residential neighborhood. Extremely kind and co-operative residents have allowed us to have this unique experience of racing down their local streets. This entry was posted in Events, News and tagged american, bearings, bearings mas rapidos, best bearings, DH, downhill, Hot spot, hot spots, igsa, longboard, longboarding, Mischo Erban, rodamientos, ruedas, rulemanes, seismic, seismic skate, seismicskate, speed, speedvents, tekton, tekton bearkings, Vernon, wheels on June 5, 2011 by seismicskate.